<0.05% Under California law persons with a blood alcohol level of less than 0.05% at the time of driving are presumed to be not under the influence of alcohol at the time of driving assuming there are no drugs that impair driving in the driver’s blood. >0.05% but <0.08% Persons whose blood alcohol level falls between 0.05% and .079% will generally not have an Administrative Per Se suspension from the DMV but still may face a criminal charge in the Court case. A prosecutor may file charges under 23152(a) alleging that your driving was impaired by alcohol even though your alcohol level was below 0>08%. 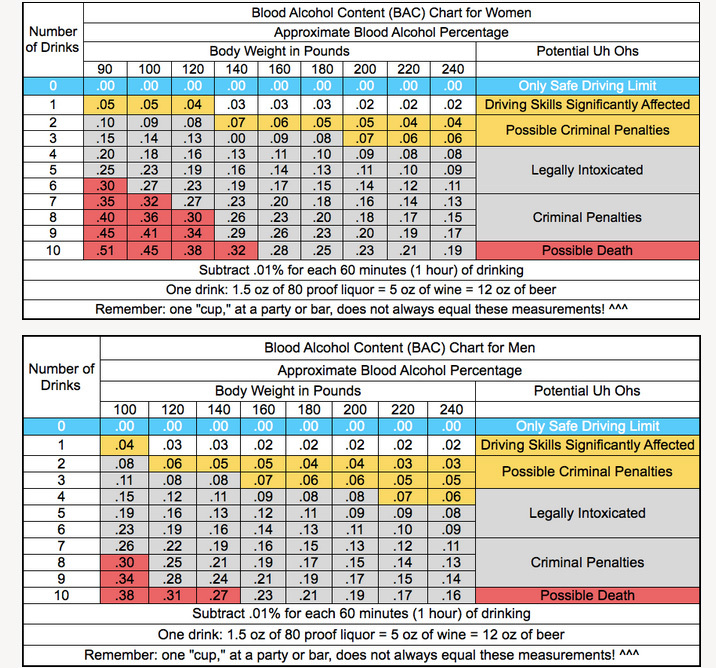 The prosecutor could also file charges under 23152(b) alleging that your blood alcohol level was above 0.08% even though you alcohol test was below that level if there is evidence that your alcohol level was above 0.08% at the time you were driving. This is done by a method called retrograde extrapolation which has been shown to be a dubious practice. >0.08% California law created a inference that a driver with an alcohol level above a 0.08% at the time of a chemical test given within 3 hours of driving is under the influence. Cases which are marginally above the 0.08% may have very credible defenses . A qualified DUI Defense Lawyer can help defend these charges and get dismissal of DUI charges for their clients. >0.15% Persons with alcohol levels above 0.15% are subject to a special enhancement allegation for an excessive BAC. This enhancement mandates that judges impose at least a six month alcohol program in place and instead of the usual 3 month program. Your license will be restricted for driving to and from work and in the course of employment and to and from the alcohol class until you complete the program. Some Judges will impose other conditions of probation for persons who have levels above the 0.15% level. Experienced DUI Defense Lawyers can can get this enhancement stricken. >0.20% Persons with alcohol levels above 0.20% are subject to a special enhancement allegation for their extreme blood alcohol level. If found to be true, the court is required to impose a 9 month alcohol program and often imposes additional conditions of probation designed to reflect the high alcohol level.